For a place the size of Yellowknife, I'm forever impressed by the opportunities that exist here. For sports, it's no exception. If it's mainstream you're after, we've got baseball, hockey, soccer, golf, and so on. But there's also more niche activities; broomball (our teams often take the world's championship), kite skiing, and in recent years, thanks to Diamond City Roller Derby, roller derby has taken off. Not knowing much about the sport, I was surprised and intrigued to find a junior graphic novel on the subject. It involves a 12 year old named Astrid who also discovers the sport and a lot about herself in the process. My first take on the book was that I wasn't wild about the art. The characters were drawn so simply almost to the point of uninteresting. Think For Better of For Worse only with less caricature. That said, I came to appreciate it and as the just as the game began to make life more interesting for Astrid, it also made the book come more alive. When it was time for Astrid to make her first "war face," it was more powerful because it contrasted so well. Also, as much as this is a roller derby story, or a coming-of-age story, it's also a pleasant tale about friendship and that uncomfortable realization that ones' interests might be pulling them apart. 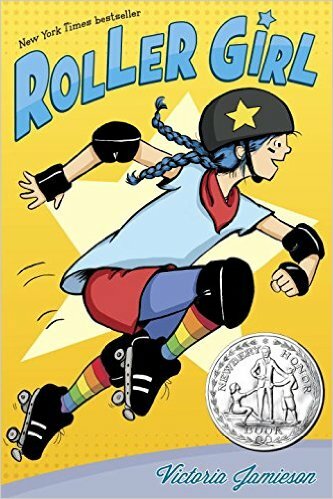 Roller Girl is fun, funny, educational, and powerful all at once. Think For Better of For Worse only with less caricature. - burn! I'm glad to hear this book redeemed itself in the end. I really liked this too. It won our Cybils award for 2015! Nicola: I'd like to get involved with Cybils again-- I was asked to judge years ago but found it too difficult to get copies of the books. I wouldn't have that issue anymore, can you email me with contacts?